This function allows users to view and process SAP Business One Invoices, with various statuses. Not Complete - ready-to-send EDI Invoice (810) messages. Sent - EDI Invoice (810) messages that have been sent. To process an open Invoices, see Processing Invoices. Invoice selection can be filtered by Customer Number (see marker 1 in the screenshot below), Posting Date range (see marker 2 below) , Status (see marker 3 below) and Due Date range (see marker 4 below) . Open Invoices can be filtered by Customer Number (1), Posting Date (2), Status (3) or Due Date (4). Use this search field to filter by Customer Number. Enter a valid Customer Code, then tab or press the Selection icon to list all Customers. Use this search field to filter by Posting Date range. Start date of the Invoice document Posting Date range filter. Use this search field to filter by Posting Date range. End date of the Invoice document Posting Date range filter. Not Complete – EDI Invoices where the Invoice (810) messages have not been sent or have not being flagged for manual processing. 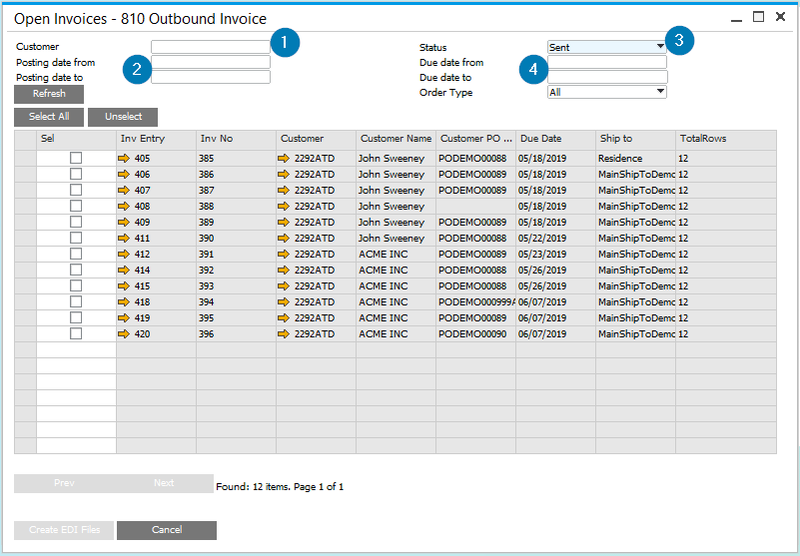 Sent – EDI Invoices where the Invoice (810) message has been sent. Manual – EDI Invoices flagged for manual processing. Use this search field to filter by Due Date range. Start date of the Invoice document Due Date range filter. Use this search field to filter by Due Date range. End date of the Invoice document Due Date range filter. Refresh selected data based on completed filters. If checked, select the Invoice for processing. Invoice DocEntry number. Press the golden arrow to open the Invoice details window. Customer Number. Press the golden arrow to open the customer's Business Partner Master Data. Press this button to process selected Invoices for creation of approved EDI Invoice (810) messages to the corresponding Business Partners (Customers). Press this button to exit the Open Invoices function.